Most tracks run counterclockwise. I've heard some alternate directions but I've never seen it. Stay in the outer lanes unless you are running fast. If you are walking, definitely stay in the outermost lane. Pay attention to other runners (you are in relatively confined space) and move to the right to let someone pass you if you hear "on your left" or "track". Don't stand on the track and try not to run more than two across to leave room for other runners. 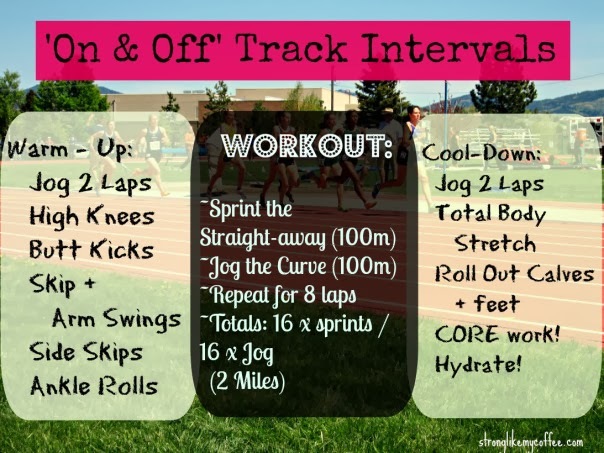 This is a great track interval workout for beginners! It's easy to follow using the straights and curves of the track as your guide, and will get you doing a lot of fast running for a short distance. Just make sure to do your non-running warm-up and cool down out of the way on the side of the track. This routine is a little more complicated (hence the lack of a nice simple instruction graphic), but the decreasing recovery time keeps it interesting and helps challenge your cardio fitness. This routine is pretty simple and easy to keep track of. 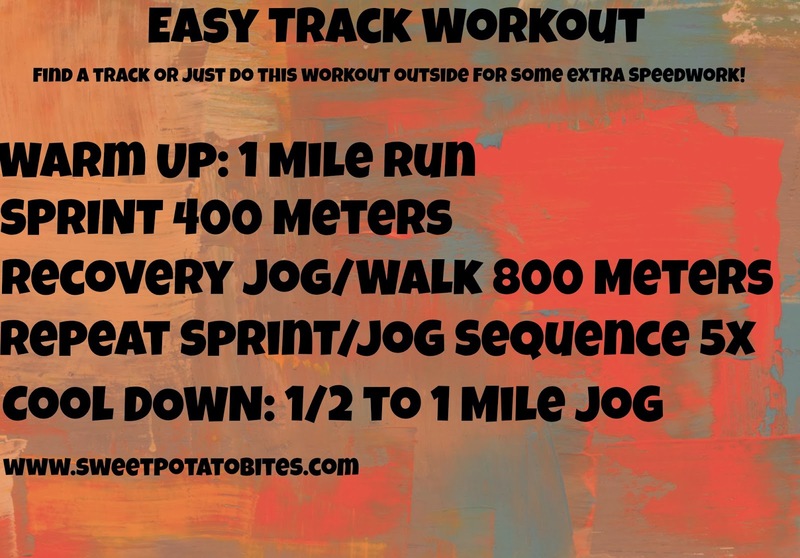 It covers 5 miles, which is no piece of cake to me, but because you can vary the sprint and recovery speeds based on your fitness level it's still good for everyone from beginning runners (like yours truly) to the more advanced. Q: Do you run on the track? Is it intimidating or am I being a wuss? Any tips? Oof that 400 meter sprint...I haven't done that since high school! I definitely want to get back on the track and try out your first workout though! Haha I know, the first time I had to sprint distances to get ready for college volleyball I couldn't even stay at my top speed for the whole 100. Going to work on it though! 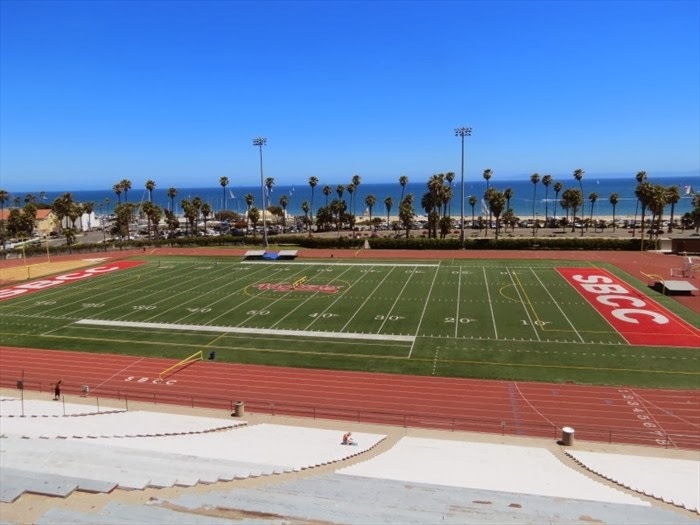 I don't run on a track but I would like too! Especially a nice track like the one you showed above! I have run on the track and can appreciate how soft it is vs the pavement. NOW those routines you posting - GIIRRRLLL you coming with it!!!! 1 mile warm up, 400 meter sprint (1 time around the track), 800 meter walk/jog and repeat 5 times? WOW!!!!!!!!!!!! That's some serious mileage. Thank you for stopping by WOW Link Up this week! Haha yes we'll see if I get through it! Might be over ambitious lol. Thanks for hosting! Not a runner but I'd probably need an audio book to keep my mind occupied on a track. I haven't run on a track on a very long time. In the Spring I hope to get back on it. Currently it's covered in a couple of feet of snow! Ooh group track workouts sound like fun! I'll definitely get on it! Yea I'll definitely get there soon! Thanks for stopping by! What you complaining about!!! At least it is warm, if it looks like what I see in the picture. You could cooped up in the house running on the treadmill if you lived in the Midwest, east or even the South. Thanks for visiting WOW. Both of these workouts are great. The variation in speed makes the workout feel faster. You're going to do awesome at your 10k.